Windows StartUp can tend to get longer as the time passes because of new applications that get added to the startup list either automatically or applications like messengers which users add for easier access which can be the cause for slower Windows OS Startup which makes it frustrating because we have to wait for all the apps to startup until which the system responsive can be sluggish, based on the RAM and other such factors. 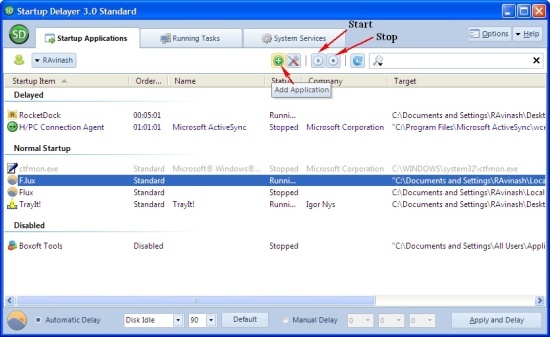 Some basic steps to fix this can be to Keep the startup list as simple and small as possible or disable applications from the startup list.Incase you are unable to find applications to remove, your can try to prioritize applications and delay start least important applications.StartUp Delayer is a free program which lets users configure the delayed start of applications making the Windows StartUp faster. First configure the application and schedule the applications which you want to start at a later time from the StartUp Delayer Configuration Window.This is where you can decide which applications you want to be part of the normal startup, add applications to the delayed startup list and Disable applications from the startup list.The window has 3 tabs StartUp Applications, Running Tasks and System Services. Start-Q is alternative to StartUp Delayer. The Running Tasks shows the list of tasks which are currently running in the background. System Services shows the list of Windows Services, which can be started or stopped by selecting the service and pressing “Ctrl + P”. New Application which are not part of the Windows StartUp can also be added to the Delayed StartUp list by clicking on the Add Application Button and selecting the application’s .exe file. Manually by setting a time delay after which the application should be launched. Such applications are part of the Delayed Applications List and can be easily understood from the Order/Delay which shows the order in which applications start. For further configuration of the StartUp Delayer, you can configure it from the “Options”. 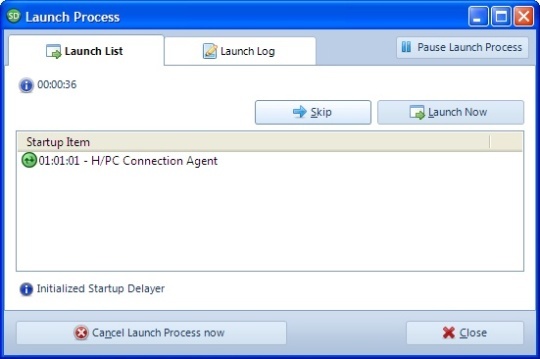 Once everything is configured, On the next system startup StartUp Delayer’s lauch Process Window lauchces which shows the list of application which are next in the queue for delayed startup.The process of lauching the applications can also be skipped, paused or cancelled all together. I think I’ll remove those programs which are causing delayed start up instead of delaying the programs. I have only 2-3 programs on startup.